Take a look at some of the UI/UX design patterns and best practices that you can expect to see in 2018 and beyond. Every year, new trends evolve in the design industry and it’s important to keep up with the latest trends and transitions in the design industry. Let's have a look what will be a big hit in future. Minimalistic design is a process of keeping spotlight on the invaluable content and getting away with the valueless clutter. Here the focus is more on the content rather than the end look and to achieve this goal designers follow some visual design principles. From the past few years, we’ve seen minimalistic trend in UI design space. A combination of minimalistic user interface and great usability works well because it’s concise, clear, content-focused and intuitive to users. Designers and developers are also inclining towards minimalistic design because It works well across various screen sizes and platforms as there are fewer elements to be stretched and which also makes the product fast and light as there are fewer elements to be loaded. We’ll be seeing more clean and minimal user interface with more focus on content in future. UI and UX should be visually pleasing and functional to make an impact on users but at the same time, it should be interactive and affable to users. Interaction with digital products should be like interacting with humans. Humanizing digital experience is related to human emotions. How the user behaves or feels while interacting with the product has a great impact on its likeness and unlikeness. Microinteractions are tiny and fluid animations which satisfy the human fundamental needs by acknowledging and providing feedback on an action. 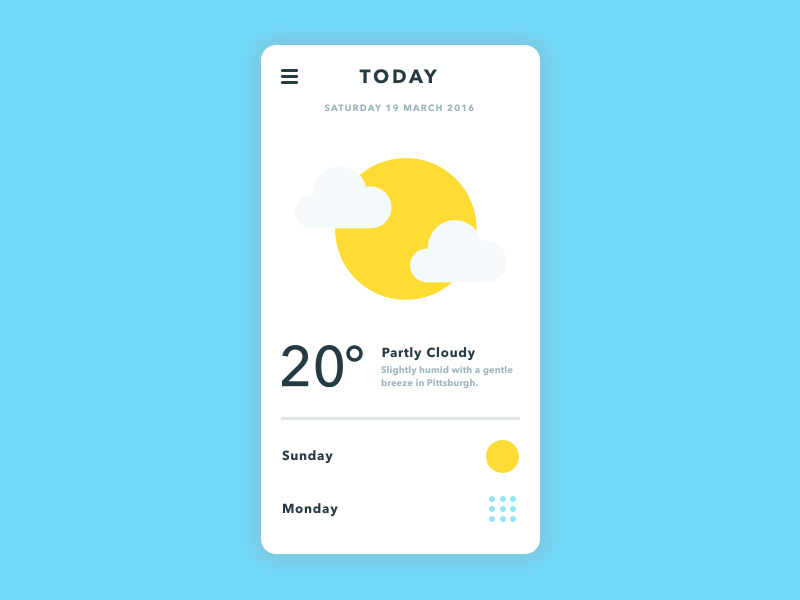 These tiny animations are very powerful in evoking emotions and connecting with users which makes the user experience more seamless and weightless. Microinteractions can be seen in every application or website we use these days, like hitting a like button on Facebook, website preloaders, turning settings on and off, app screens transitions etc. Cards are like containers which can contain a short piece of information about a single topic — an image, text or links. Cards are the best way to share information in a clean and in an organized form, as it’s intuitive to users without any explanation. The foundation of cards was laid by famous image sharing site Pinterest and then popularized by big giants like Microsoft, Google, and Facebook. As internet space is inclining towards mobile, responsive design has become mandatory which has resulted in the popularity of cards. Also with the rise of minimalism in user experience space, cards will remain a big hit in future. Illustrate means “to clarify.” Illustrations are visual elements, which helps in communicating the message or story with users in a creative way. The digital world is surrounded by beautiful websites and applications, and to stand out in the crowd it’s quite important to make your product visually pleasing to capture users. Designers prefer illustrations as it gets noticed easier than the text and communicates better with users; it also gives designers the freedom to play with animations and create a visual language. From the past few years, we’ve seen illustrations becoming popular and alternative to photographic images as they are light and can stretch across various screen sizes and platforms. Prototyping is presenting an idea inside your head to others. A prototype could be in the form of sketches, wireframes, storyboards, or high rendered designs. Although sketches and wireframes are great ways to produce ideas, they are not a good way to present it to clients or stakeholders. The best way would be to present how user will interact with the product in real, this approach gives better vision of product to the clients and stakeholders. Designers are focusing more on prototyping these days and it has become an integral part of UI design flow and with the rise of prototyping tools in the market: Sketch, Adobe XD, Principle, Invision studio, After Effects. It has become much easier for designers to bring their ideas to life. 2013 was the year of flat design and simple color schemes which made the internet look more similar and boring. But from the past few years, we’ve seen designers playing with bold, vivid colors, gradients and typography. In 2018 we’ll be seeing a colorful user interface with more focus on typography. AI is revolutionizing the way we interact with digital machines, with the rise of human-like personal chat and voice assistants like Siri, Google Assistant, Cortana, and Amazon Alexa. User interaction has become more natural, intuitive and effortless with technology. With the advancements in artificial intelligence technologies (machine learning, natural language generation, speech recognition, virtual agents, deep learning, and decision management), artificial intelligence will take user experience to another level and will be a game changer in the world of UX.